Thrive in this Cozumel at Cape Marco residence! Life is good! Balmy breezes and sunset caress you relaxing at days end. Share a toast with family and friends on your spacious balcony overlooking the world famous Marco Island crescent beach. Watch the golden crimson glow of sunset light up the beach and Gulf watersâ¦..or the twinkling night skyline of Marcoâs beach. Priceless! Cozumel is Cape Marcoâs best beach view residence. Inside this 9th floor residence find a mediterranean flair with magnificent beach and ocean views from all major rooms â master suite, living room, dining and kitchen areas. Live amid ample 2832 sq ft interior space with 3 full bedrooms 3 full baths for comfort and privacy, and office or library. Very easy access to this garage parking space. You have a private enclosed storage locker and a room for kayaks and beach gear. Cozumel is the only luxury building on the beach with a private large green yard space in front. It has THE best fitness room on the beach, the only ground level panoramic view social room for parties and events. 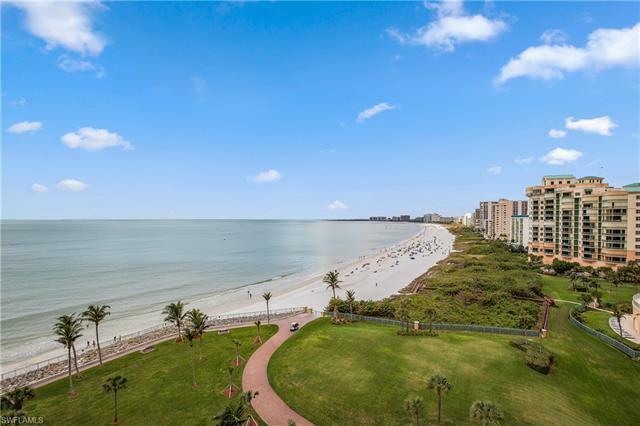 Cape Marco offers 24 hour gate, dramatic fountains accent entry, 6 soft surface tennis courts, separate fitness clubhouse.